Amy Tyndall Design is a full-service interior design firm that works with clients from concept to completion in order to create beautiful, functional spaces. As such, Amy Tyndall Design tasked Sage Island with creating a website that would showcase the client’s portfolio and services, as well as prompt website visitors to fill out the contact form for more information about starting their own projects. The client needed the website to demonstrate the firm’s capabilities and style by featuring a variety of projects, each with photos of the finished product and descriptions of the work performed. The client also wanted her website’s aesthetic to reflect her newly-created brand. Because the client had such a visual service to advertise, Sage Island’s design team created a layout that would showcase large photographs of the completed projects. The homepage is especially image-heavy, with a full-width slider that cycles through a selection of the client’s photographs from a few of her best projects. The team also created custom-styled photo galleries for each of the client’s interior design projects. Every gallery now contains anywhere from 10 to 40 carefully curated images arranged in a tidy, easily navigated grid. 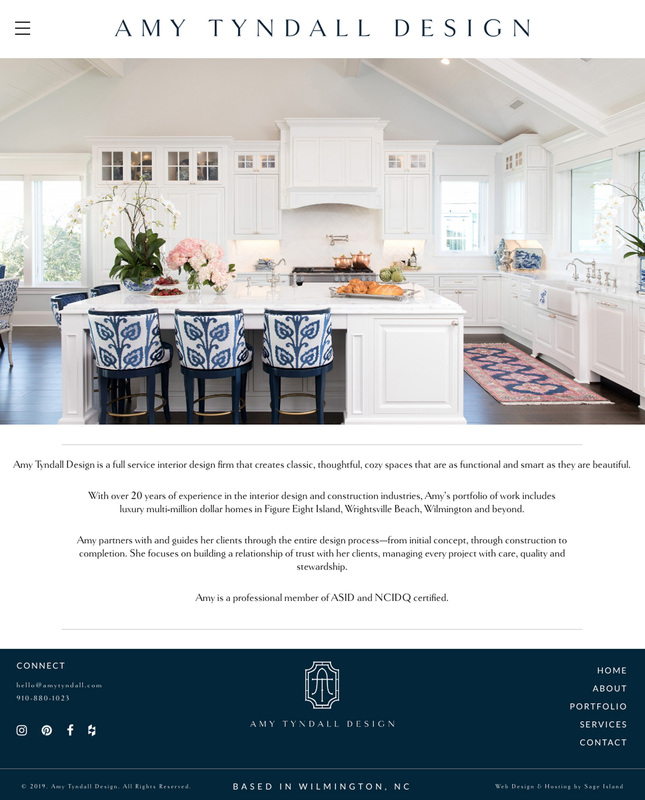 We saw that the client was very active on social media — especially Instagram — so our team utilized a WordPress plugin to automatically pull the Instagram feed onto the Amy Tyndall Design website. Our developers styled the plugin to be elegant and on-brand. Website visitors and potential clients can enlarge images and browse the feed without leaving the website. Our design team recently created a logo and brand strategy for the client. The new website had to not only reflect that branding, but also the style of the client’s interior design projects. Amy Tyndall Design is known for an extremely tasteful, modern aesthetic with meticulous attention to detail, so our designers made sure that the website had a similar style. They did this through liberal use of white space, a grid-like layout, a simple color palette, and minimalistic typography.